A Dog's Purpose is . . . MURDER. DEATH. CARNAGE. Premise: A dog learns his true purpose in life after being reincarnated several times over and living multiple lives with different owners. Behind-the-Scenes: Based on the book by W. Bruce Cameron. The film got into some hot water with PETA close to its release date after video surfaced of some questionable animal handling during filming. The filmmakers deny any wrongdoing and argue the video was doctored. Lasse Hallstrom (Chocolat, The Cider House Rules) directs. 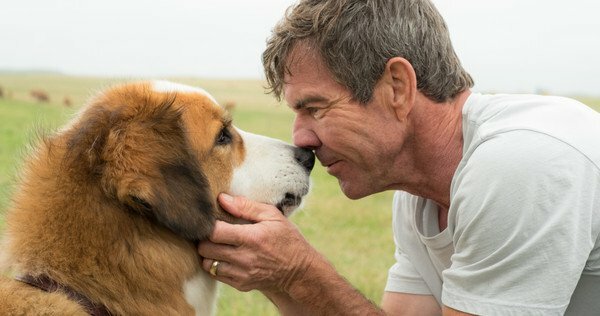 The Good: The movie wears its heart on its sleeve and is unabashedly sentimental about dogs - it caters precisely to its intended audience and gives them exactly what they want: cute shots of cute dogs doing cute things to which all dog owners can relate. On that front, it delivers. Kids will enjoy it, even through their tears. The acting is solid, with nice, understated work from Dennis Quaid and Britt Robertson, among others. The Bad: This is an awfully masochistic viewing experience. It basically forces you to watch four different dogs die all in the span of some 90 minutes, suggesting that death is perhaps a dog's true purpose. If that's not your thing and movies like Old Yeller and Marley & Me cause you great trauma, stay far far away. The tone veers wildly off course in parts - with some unnecessarily harrowing and bloody sequences in the middle. The sentiment, though honestly conveyed, is clumsy in execution. Should You See It? : No. You can skip it. And not just because PETA tells you . . . but feel free to use that as an excuse. Star Rating: **1/2 out of 5 stars.